The coat o airms o Singapore wis adoptit in 1959, alang wi the ither naitional seembols o Singapore. Uisin elements frae the naitional banner, the lion seembolises the current state an the tiger honours its cultural links wi Malaysie. While the uise o the coat o airms is restrictit tae the govrenment, the seembol enjoys wide uise on the naitional currency, state decorations an appears on the cover o the naitional passport. When Singapore achieved the richt o sel-govrenment in 1959, the Prime Meenister Lee Kuan Yew needit a state coat o airms, amang ither seembols, tae be creatit for the new state. Afore sel-govrenance, the coat o airms uised bi Singapore wis the coat o airms o the Unitit Kinrick. A committee wis formed tae create the state seembols, which wis heidit bi deputy prime meenister Toh Chin Chye. Juist lik wi the naitional banner, Toh wantit the state seembols o Singapore tae signify the unitit multi-ethnic society o the kintar. In the span o twa months, the state coat o airms an the banner wur completit bi Toh an his committee. A law establishin the state seembols o Singapore wis presentit tae the Naitional Assembly bi the Menister o Cultur, S Rajaratnam. The Naitional Assembly approved it in November 1959. On 3 December 1959, the state coat o airms, banner an anthem wis presentit tae the fowk o Singapore for the first time. In the case o the state crest, again we got the five starns an the new muin… A lion next tae the tiger. Tiger o course is a mair local animal than the lion. The auld Ceety Cooncil haed a lion. It did merge wi oor awn ideas o sel govrenin o Singapore. The central emblem o the coat o airms is a reid shield wi five white starns restin abuin a white crescent. The crescent an five starns are an aa uised on the Singapore banner an ither various naitional seembols, such as the naitional ensign for ceevilian ships. The seembolism o the reid colour, alang wi the white crescent an starns is the same as that o the naitional banner. The supporters o the shield are a lion an a tiger; the tiger seembolizes the historical connections tae Malaysie an the lion represents Singapore. Belaw the supporters is a blue ribbon wi the naitional motto, "Majulah Singapura" written in gowd. 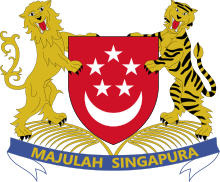 "Majulah Singapura", which is Malay for "Onward Singapore", is an aa the title o the naitional anthem o Singapore. Stairtin in 1985, the Monetary Authority o Singapore (MAS) began tae issue thair seicont series o coins for circulation. On the reverse o the coins, the coat o arms is placed, surroondeit bi the name o Singapore in the fower offeecial leids (Cheenese, Malay, Tamil an Inglis) an the year o mintin. In 1987, the dollar coin wis circulatit, an aa wi this same pattern. An aa, accordin tae the MAS, the coat o airms appears on aw Singaporean banknotes syne the Orchid series o 1967. State decorations o Singapore an aa uise depictions o the coat o arms on the medallions. For example, the Darjah Utama Temasek an the Sijil Kemuliaan uises the full achievement o airms on the medallion, while the Darjah Utama Bakti Cemerlang uises the shield on the front o the medal. Accordin tae the Singapore Airms an Banner an Naitional Anthem Rules, the uise o the coat o airms is restrictit tae the govrenment. Athoot explicit permission frae the Meenistry o Information, Communications an the Airts (MICA), a body or group are no alloud tae pheesically prent, manufacture, display or sellin onything that haes a depiction o the coat o airms an no alloud tae cause such actions tae happen. It is an aa forbidden tae uise a seembol that can be easily mistaken for the coat o airms. Bodys who wish tae uise the coat o airms in a literary wirk must an aa obtain permission afore uise frae MICA. The anerlie exceptions providit bi the Rules is the airms can be uised bi govrenment offeecials an meenistries on thair biggin exteriors an on printit documents. ↑ "State Crest". Singapore: The Encyclopedia. Editions Didier Millet and the National Heritage Board. 2008. Retrieved 2008-12-25. ↑ Zaubidah Mohamed (9 June 2003). "National coat of arms (State crest)". Infopedia. National Library Board Singapore. Retrieved 2008-12-25. ↑ 3.0 3.1 Toh, Chin Chye (1989). "Dr. Toh Chin Chye [oral history interview, accession no. A1063, reel 1]". National Archives of Singapore. : "State symbols". Access to Archives Online (a2o), National Archives of Singapore. Retrieved 2007-11-04. ↑ Second Schedule of the Singapore Arms and Flag and National Anthem Rules (Cap. 296, R 1, 2004 Rev. Ed. ), as amended by the Singapore Arms and Flag and National Anthem (Amendment) Rules 2007 (S 377/2007). See also Lee, Kuan Yew (1998). The Singapore Story: Memoirs of Lee Kuan Yew. Singapore: Times Editions. pp. 342–343. ISBN 9812049835. ↑ 5.0 5.1 "The National Coat of Arms (State Crest)". Ministry of Information,Communications and the Arts. 2004. Retrieved 2008-12-24. ↑ "Singapore Circulation Coins - Second Series". Monetary Authority of Singapore. 19 March 2007. Retrieved 2008-12-24. ↑ "Singapore Circulation Notes - Orchid Series". Monetary Authority of Singapore. 19 March 2007. Retrieved 2008-12-24. ↑ "National Honours and Awards - The Order of Temasek". Office of the Prime Minister of Singapore. 11 December 2008. Retrieved 2008-12-24. ↑ "National Honours and Awards - The Certificate of Honour". Office of the Prime Minister of Singapore. 26 September 2008. Retrieved 2008-12-24. ↑ "National Honours and Awards - The Distinguished Service Order". Office of the Prime Minister of Singapore. 26 September 2008. Retrieved 2008-12-24. ↑ Singapore Arms and Flag and National Anthem Rules (Cap. 296, R 1, 2004 Rev. Ed. ), as amended by the Singapore Arms and Flag and National Anthem (Amendment) Rules 2007 (S 377/2007). Wikimedia Commons haes media relatit tae Coats of arms of Singapore. This page wis last eeditit on 30 August 2018, at 13:25.